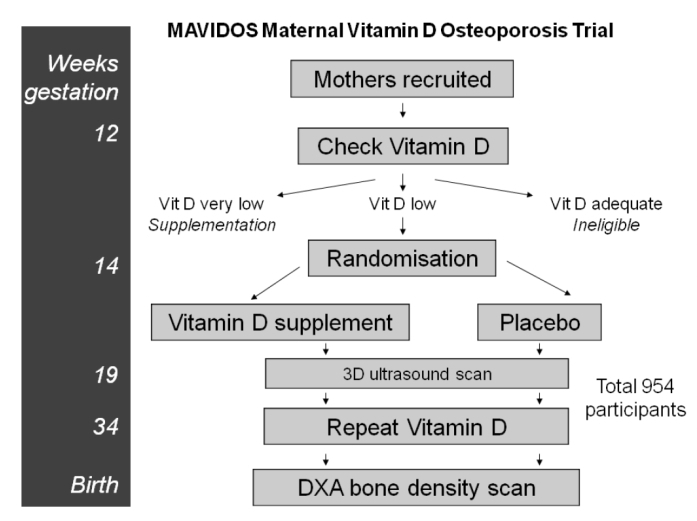 The MAVIDOS Maternal Vitamin D Osteoporosis Study is a randomised, double-blind, placebo-controlled trial of vitamin D supplementation in pregnancy women. 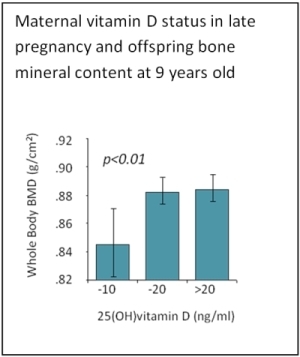 The aim is to test whether offspring of mothers supplemented with vitamin D in pregnancy have higher bone mass at birth than those who mothers who were unsupplemented. Vitamin D insufficiency is common (30% in a recent Southampton cohort) and in pregnancy predicts reduced bone bass in the offspring. Our previous work has demonstrated that children born to mothers who had low levels of circulating 25(OH)-vitamin D in pregnancy are likely to have reduced bone mass compared with children born to mothers with higher levels. 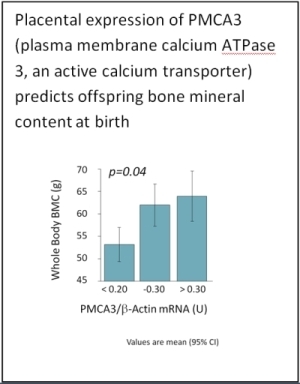 This effect may be mediated through reduced placental calcium transport, and further work has suggested that the level of a placental calcium transporter protein is positively related to offspring bone mass at birth. Women have their vitamin D status assessed after ultrasound scanning in the twelfth week of pregnancy. Women with circulating 25(OH)-vitamin D levels 25-100nmol/l will be randomised in a double-blind design to either oral vitamin D supplement (1000iu/day) or placebo at 14 weeks. Questionnaire data will include parity, sunlight exposure, dietary information, cigarette and alcohol consumption. Women will be reviewed at 19 and 34 weeks when maternal anthropometry will be assessed and blood samples taken to measure 25(OH)-vitamin D, PTH and biochemistry. At delivery venous umbilical cord blood will be collected, together with umbilical cord and placental tissue. The baby will undergo DXA assessment of bone mass within the first 14 days after birth, and followed up regularly through childhood, with a repeat DXA assessment at 4 years. The MAVIDOS study has the potential to inform public health policy with regard to vitamin D supplementation in pregnancy. It is one of the first ever human clinical trial to test the early life origins hypothesis and should provide a valuable opportunity to additionally investigate the role of vitamin D in other outcomes such as allergy and asthma.